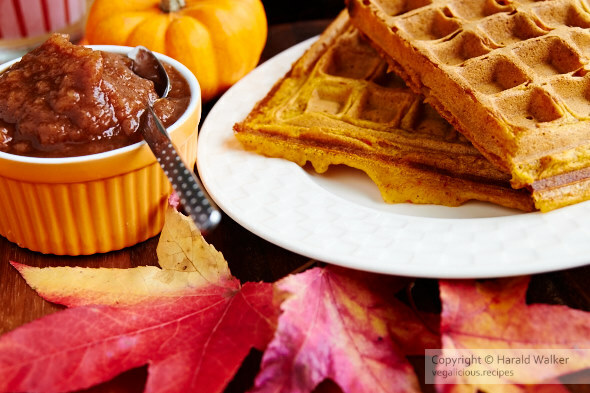 Yesterday we enjoyed pumpkin waffles for our Sunday morning breakfast. These were lovely, I made half the recipe for just the 2 of us. I must admit, they didn’t rise as much as the usual ones. Perhaps my pumpkin puree (homemade) was a bit more liquid than a store bought one. Next time I will add a bit more of the baking powder and baking soda. They tasted lovely with home made apple butter, but the traditional, maple syrup was the best. The pumpkin waffles were a nice treat, and a great way to use up the rest of my pumpkin puree. Posted by Chris Walker on October 20, 2008 in Breakfast, Pumpkin, Reviews.